Amidst La Rioja Mountains, at 4,000 metres of height, lies a series of astonishingly clear water lakes. The area where Laguna Brava (literally: “Rough lagoon”) is located has been designated a “Ramsar Site”, (Ramsar is the Irani city where The Convention on Wetlands of International Importance was signed in 1971). The tour to Laguna Brava is a moment for peace and tranquillity, where only nature, colours, sounds and emotion are protagonist. At the beginning of the tour, the view is one of colourful mountains, washed in countless hues, resulting from the various minerals that form them. The visual effect of light and shade, along the way, prepares visitors for an encounter with the immensity of La Rioja's Andean plateau. The lagoon is surrounded by a series of snow-peaked mountains known as “Los Seis Miles” (“The six thousanders”, as all the peaks are over 6,000 metres high) which guard a shelter of the most beautiful birds on earth: flamingos. 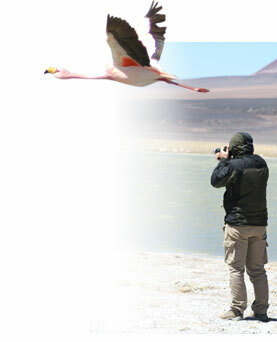 During September, the birds are found in the greatest amounts at Laguna Brava, seemingly dyeing it pink. The great Argentine poet, Atahualpa Yupanqui, who was a restless and passionate explorer of his country, visited this site in 1940 by foot, attracted by folk stories that told of a rough, deep lake sited high in the mountains where no humans dwelled, surprisingly finding a still mirror of water. “What I found was nothing like the legend described, but my eyes were filled with the vision of that enormous, tranquil lagoon, covered with pink spots”.